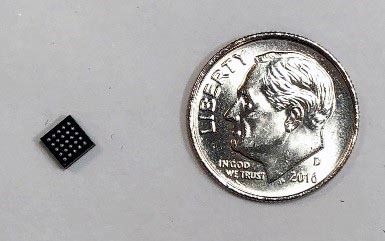 Analog Devices announces the Power by Linear™ LTM8074, a 1.2 A, 40 VIN µModule® step-down regulator in a tiny 4 mm × 4 mm × 1.82 mm, 0.65 mm pitch BGA package. Its total solution size is 60 mm2 for 3.2 VIN-40 VIN, 3.3 VOUT requiring only two 0805 capacitors and two 0603 resistors. The low profile and light-weight (0.08 g) package permits the device to be assembled on the backside of PCB where the topside is often very densely populated. 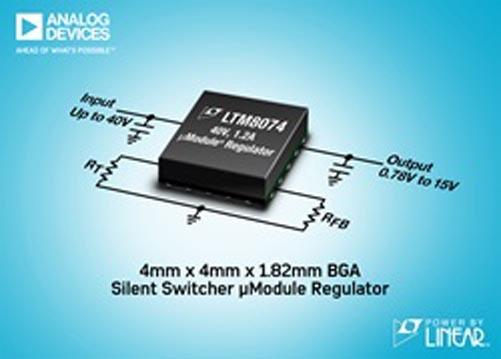 Its Silent Switcher® architecture minimizes EMI emissions, enabling the LTM8074 to pass CISPR22 class B, and reduce the possibility of EMC susceptibility to other sensitive circuits. 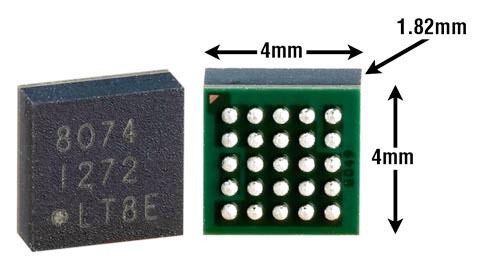 The LTM8074 can withstand up to 40 V input and safely operate from an unregulated or fluctuating 12 V or 24 V supply in noisy environments such as avionics, factory automation and industrial robotics. The output voltage is adjustable with one resistor from 0.8 V to 15 V. This wide output voltage range provides versatility, allowing one product to generate voltage rails for I/O and digital ICs, as well as common system bus voltages such as 3.3 V, 5 V and 12 V. The LTM8074 delivers 1.2 A of continuous or 1.75 A peak output current from 24 VIN to 5 VOUT in an 85 °C ambient environment. The switching frequency can be set by an external single resistor, ranging from 200 kHz to 2.2 MHz or can be synchronized to an external clock. The LTM8074 has four operating modes: Burst Mode® operation, pulse-skipping mode, pulse-skipping mode with spread spectrum and external sync mode. The combination of Silent Switcher architecture, wide operating frequency range and multiple operating modes minimizes the risk of problems caused by electromagnetic interference, making it ideal for noise sensitive signal processing applications, including imaging and RF systems. The LTM8074 operating temperature range is –40 °C to 125 °C. 3.3 VOUT from 4.5 VIN to 40 VIN Step-Down Converter.